according to PULO’s statement issued through its website on January 29. In the statement, the Nampra Army warned people, both Muslims and non-Muslims In the restive region to stay away from military camps otherwise PULO will not take responsibility for deaths or injuries sustained from the rocket attacks. 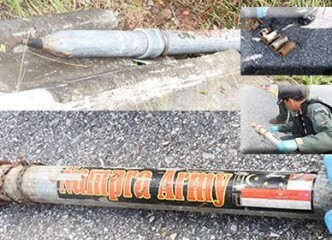 In the infopatani webpage, Nampra Army claimed that the rocket found in Pattani was its own product and it had nothing to do with IS or Islamic State. Informed security source in the Deep South said that Nampra Army was the name of army wing of PULO during 1976-1990. 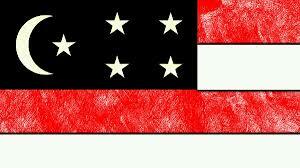 It came from Malayu language which read Negara Melayu Patani Raya. The Nampra Army’s sticker shows the flag of PULO MKP which is led by Kasturi Mahkota who split from PULO many years ago. 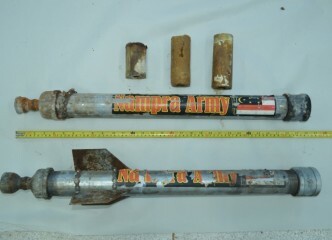 Informed military source admitted that the finding of the rockets and relevant information was the first hard evidence to prove that PULO MKP of Mr Kasturi was not just a political group but with its own army too and might have the capability to carry out violent incidents in the restive region. The source said that the Thai military and the government used to pay little attention to PULO MKP for its lack of army but now have to change their perception of the group. However, the source said that the rockets might just be a propaganda of the group to enhance its military strength and potential because all the five rockets that were found, including three which exploded, none of them have caused serious damages to any military targets. 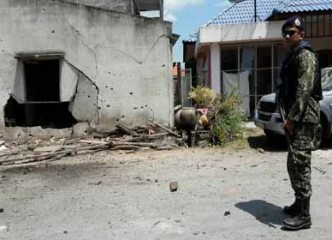 The latest rocket attack took place in Bacho district of Narathiwat on February 5. The rocket struck at the house of Mr Muhamarusdee Saley in Ban Kayomadee. The rocket did not explode and EOD officials later had to destroy it at a soccer field in the compound of a religious school. 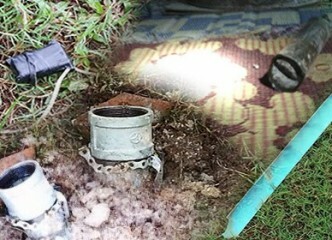 At the soccer field, EOD officials also found what they believe to be the launch tool of the rocket – a PVC tube about one metre long and cut in half which was half-buried on the ground. Electrical wire tied to dry-cell batteries were also found. Security source said that the militants might just test-fired the rocket in order to find out its capacity, firing distance and accuracy. Of the five rockets, four were fired and the target appeared to be the Pattani airport or the 18th infantry division command which are located close to each other. Security forces have been trying to find out where the rockets were produced and the makers of the rockets. The military has insisted that they were not rockets but merely improvised rockets, said the source, adding that there must be launchers for the rockets to be more effective.